Concrete blocks are commonly used in basement and foundation walls. Unfortunately, producing a key ingredient of these blocks – cement – generates lots of carbon-dioxide emissions. But what if you could make blocks in a way that soaks up CO2, instead of releasing it into the atmosphere? That’s the idea behind Carbicrete, a Montreal-based company founded in July by a team of McGill University graduates. Concrete blocks are a staple of the construction industry, commonly used in basement and foundation walls. Unfortunately, producing a key ingredient of these blocks – cement – generates lots of carbon-dioxide emissions. But what if you could make blocks in a way that soaks up CO2, instead of releasing it into the atmosphere? That’s the idea behind Carbicrete, a Montreal-based company founded in July by a team of McGill University graduates. The fledgling startup got a big boost last month, when it was named one of 27 teams advancing to the second round in the $20M NRG COSIA Carbon XPRIZE, a global competition to develop breakthrough technologies that convert carbon-dioxide emissions from power plants into high-value products. The four-person team is composed of Mehrdad Mahoutian, a research associate in the Department of Civil Engineering and Applied Mechanics; Chris Stern, a Mechanical Engineering graduate who previously ran a successful solar-power business; Yuri Mytko (BA’98); and Mario Venditti, a Mechanical Engineering and MBA graduate. Members of the team were also among the winners in the “Innovation-Driven Enterprise” category of the 2016 McGill Dobson Cup competition. Mahoutian worked on the technology as a PhD student with McGill engineering professor Yixin Shao, with whom he shared a 2015-2016 William and Rhea Seath Award in Engineering Innovation from the Faculty of Engineering’s Innovation and Entrepreneurship hub. 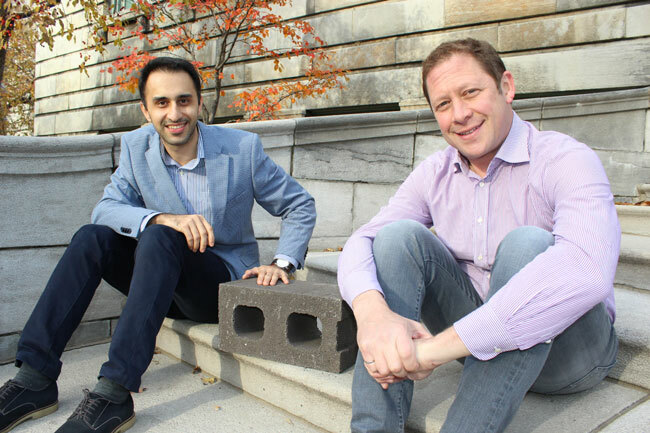 The approach developed in their laboratory involves the use of an industrial residue – the slag from steel factories – to replace cement as a binding ingredient in concrete blocks. The process also injects CO2 gas into the fresh concrete to give it its strength, as well as permanently sequestering CO2. With those advantages in mind, Carbicrete is seeking strategic partners to help bring the technology to market. The Carbon XPRIZE contest, meanwhile, provides a high-profile opportunity to demonstrate the technology’s potential. The XPRIZE organization, based in Culver City, Calif., sponsors a variety of competitions designed to generate “radical breakthroughs for the benefit of humanity.” The Carbon XPRIZE, launched in September 2015, is sponsored by U.S. power company NRG and by COSIA (Canada’s Oil Sands Innovation Alliance), an alliance of 13 oil sands producers. The four-and-a-half-year competition includes demonstrations by finalist technologies at either a coal or a natural gas power plant. Semifinalist teams in the competition hail from China, India, Switzerland, Scotland and the U.S., as well as Canada. They include carbon-capture technology companies, top-tier academic institutions, non-profits and new startups. The teams propose converting CO2 into products as varied as building materials, biofuels and toothpaste. The teams in Round 2 will demonstrate their technology at pilot scale at a location of their own choosing. Over a 10-month period, teams will be scored on how much CO2 they convert and the net value of their products. Following Round 2 judging scheduled for November and December 2017, up to five teams in each track will share a $2.5 million milestone purse and move onto the finals of the competition, demonstrating their technology at real-world power plants. Can you send me more technical information on Carbicrete and also any information you have on strength and durability testing and any commercial field trials that have been done on this type of concrete.